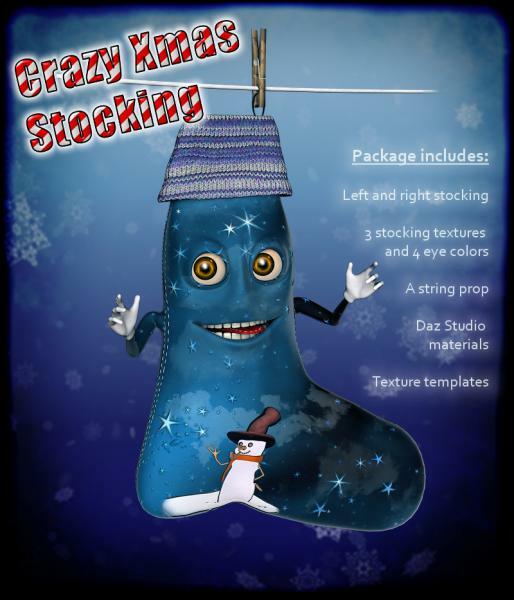 Crazy Xmas Stocking is an original toon character created with Blender and rigged using Daz Studio 4.7. This freebie can be used for personal and commercial projects as long as you don't resell it in whole or in part or re-distribute it without prior written consent. Tested in Daz Studio 4.7, Poser 9 and Carrara 8.5.
peacedove (1 year ago) Inappropriate? Cute, thank you very much. I'm having a lot of fun rendering this. Such a unique character. Thanks! Fantastic and amazing xmas socks... :) Thank you very much for sharing. Marco (4 years ago) Inappropriate? Leilana (4 years ago) Inappropriate? Thank you very, very much! Thats a beautiful freebie!